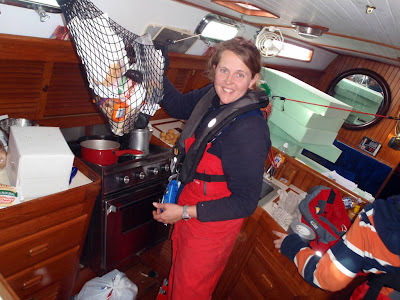 s/v Pelican - Following A Dream: Land stinks! Chris here… Sorry about it taking so long to post a new blog entry. Kristen’s parent’s have been around, and between that and a lot of boat maintenance we’ve been fairly tired in the evening. I figured we should start by telling you about our passage from Charleston to Vero Beach, and then we can update you on all of our happenings since we arrived here – including a leak below the waterline on Pelican! We had a tough time leaving. Charleston was an agreeable city and we were comfortable among friends. All of the people we met along the docks engaged us in pleasant conversation – overall, I’d say Charleston was a great example of what I thought the south would be. After two and a half weeks, though, it was time to depart. We watched for a weather window but they were few and far between. The number of people at the docks and in the anchorage all planning to depart grew on a daily basis, everyone waiting for some warmth, fair winds and calm seas. It wasn’t meant to be, so our interest turned to weather that would only be uncomfortable as opposed to dangerous, and finally a front passed and we were presented with several days of opportunity. Preparation for departure actually occurred two days prior to leaving. We deflated our smaller dinghy (the one we used until our RIB with the hole from the oyster patch was repaired), tied everything down on deck, strung the jacklines, filled our tanks with water and fuel, put away all of our shore items and took out all of our passage items. The forecast called for winds of 10-15kts, from the southwest – right on our nose – and seas of 2-3 feet. The only downside was the cold, with predictions for our first day showing highs in the 30’s and overnight temperatures in the 40’s. It was at this point that Provence told us that they would be leaving a day later, as did Evolution, so the decision was easy – we would wait one more day, until Thursday, with slightly higher temperatures and similar winds. This actually allowed us to have a whole day of rest before our passage, and we think that will become a regular thing each time we plan on being out for more than a day. Thursday morning rolled around. As usual, our attempt to leave early – 7:30am – was thwarted by a cruiser mentality. Between waiting for Martin from Evolution to drop off the heater we had lent him (and then chatting for 20 minutes), to helping Provence tie up to the dock so they could get water, it was 8:30am before we actually left. 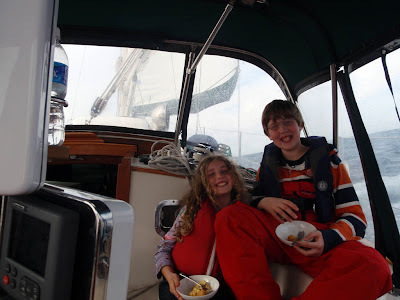 With the Megadock behind us and an ebb current pushing us along at 8-9kts, we quickly made our way down the river and out the Charleston Harbor channel. By 9:30am, we were by “Green 15” on the outside of the channel and turning south toward our destination. We had spent a lot of time before our passage planning our trip. 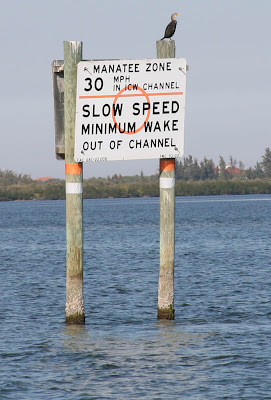 Our original path had us heading directly from Charleston to the Ft. Pierce inlet, some 340 miles in length and almost 90nm offshore at points. I also created an alternate route, closely following the coast at about 10nm offshore. This increased the distance to about 380nm, adding 6-7 hours of time to the trip and requiring us to be much more vigilant about fish havens, buoys and other boats. After it was pointed out that my direct route would take us directly across the Gulf Stream (this can be bad since the Gulf Stream likes to throw big steep waves at you), I came up with our final route – midway between the two at about 35-40nm offshore and 355nm in length. The day was fairly clear and the air was chilled as we headed south. We counted our blessings that I had our full enclosure modified before leaving Annapolis, so the wind was minimal and there was some warmth inside our cockpit. As a matter of fact, by midday we were actually hot, and we took our jackets off the cool down. Sometime around noon we heard two large cracks in the air. Concerned, we darted about looking for a problem, but when it happened again I realized it was the sound of sonic booms from military aircraft accelerating past the sound barrier overhead. They aren’t allowed to break the sound barrier while over the continental US, so they wait until they are several miles offshore before showing their true potential. We continued on our path, bringing us about 30nm offshore. As I mentioned, wave heights were predicted to be at 2-3 feet. It took me a while to understand this, but reported and predicted wave heights are a best guess of the AVERAGE height of the highest one third of all waves. More information on how wave heights are predicted can be found at http://www.nws.noaa.gov/om/marine/faq.htm#14, but the point of this is that many waves will be much larger than the predicted wave height, and as the time between waves decreases, the number of times you get hit by a larger wave increases. Unfortunately, the National Weather Service doesn’t usually tell you the predicted time between waves for coastal forecasts (they do for far offshore forecasts). Anyway, once we were about 30nm offshore, we found ourselves in frequent 6-7 foot waves, very close together. I’m not going to do the math for you, but this basically meant that we would come up over the top of a wave, head down the other side, and another wave would be ready and waiting to sweep across our deck. It was safe but very uncomfortable, and we found that – again – our V-Berth was leaking like a sieve. I decided to head inshore by a few miles to seek a few less bumps. We actually had pretty incredible sailing until we turned. Once we turned, we found the waves were directly on our nose, so we turned some more. We figured we’d see how it worked out. We became pretty frustrated throughout the rest of the day, though, as our speed over ground rapidly decreased and we were only making about 2.5kts at most times. No matter what we did – sailing or motoring – we couldn’t seem to hold out speed above 3kts for long. Our 3 day trip was quickly going out the window, but such is life on passage. The nighttime forecast called for 10-15kts overnight, from the southwest (meaning we would be heading into the wind again), with 2-4 foot seas. 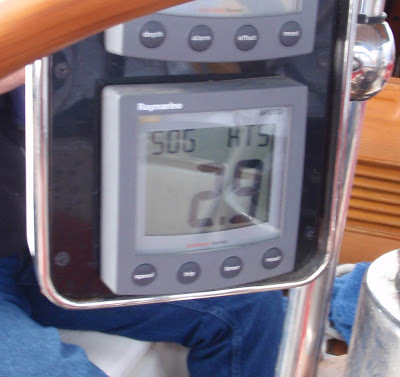 Of course, we instead had a consistent 20kt breeze with many gusts to 25kts, and 5-6ft very steep seas. There was plenty of water in the V-Berth, and we found a few new leaks with all of the greenies over the bow. At this point we had only our mainsail up, but the wind was coming from the exact direction we wanted to go. 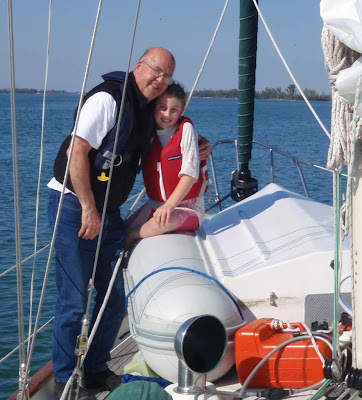 We could head on course, but not be able to use the mainsail for stabilization, or we could turn 35 degrees off course, sail, but have our nose directly in the waves. I chose to zig zag and tack back and forth to make progress, but with our forward speed so low and all of the tacks, we didn’t make much progress overnight. At midnight, Kristen came up to relieve me on watch. I was exhausted after keeping us on track for just four hours. Our original watch plan had me taking the 8pm-12am shift, but staying up for as long as I could before handing over the controls to Kristen at midnight. Kristen would then take the 12am-4am watch, alone, with her father (Poppi) and Casey taking over for the 4am-8am shift. 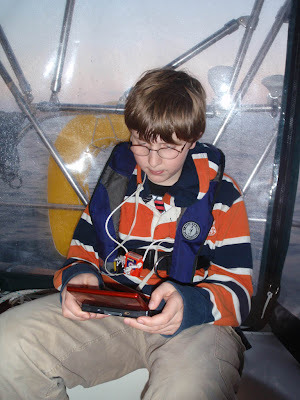 We figured that Casey knows the boat as well as Kristen and I, so he would be a good teammate for Poppi, running the electronics and helping Poppi find the things he needed while underway. My shift change couldn’t come soon enough – I was having trouble keeping my eyes open at 10pm, let alone midnight, so I was relieved to see Kristen pop her head up at 12am on the dot to take over. Because of how heavy the seas and wind were, and since Kristen is still becoming comfortable with Pelican, I opted to stay in the cockpit and catch catnaps while she stood watch. I really enjoyed spending the time with her, just the two of us on the sea. Her watch was fairly uneventful, with strong winds and steep seas and many tacks, and Poppi and Casey came up for their watch at 4am. Everything after that was a blur for me as I went below and quickly fell asleep. Speaking of below, we still needed to find a good storage system for our belongings, as the cabin, again, looked like a hurricane hit it – clothes, jackets, papers and books littered the floor, with the dinette seats covered with, well, stuff. Everything that was on the tables had succumbed to the pounding of the waves and was underfoot, making it difficult to walk below. The head was also a treat to use, and I found myself alternating between being glued to the seat (real sailors sit) and being weightless as we pounded through the seas. Oh well – trying to hold on certainly made for good entertainment! Kaitlin had gone to sleep in the V-Berth, even with the pounding waves. She woke up when I went down below and felt horrible. 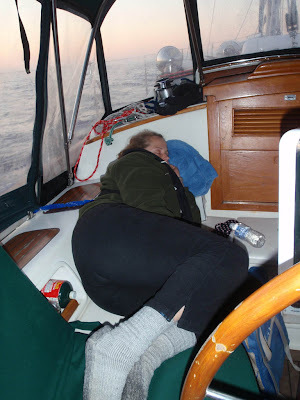 Apparently, you can get seasick while sleeping without waking up. She quickly ran to the head to, well, I'll leave it up to your imagination. There definitely wasn't a smile on her face, nor was the head very pretty when she was done. She felt a bit better after heaving, so we set her to bed in the aft berth - with a little less zero-gravity as we bounced around. I awoke on Day 2 to slightly better conditions. The wind had shifted to a better heading, so we got the genny out and we were able to do long southbound tacks at 6-7kts. We were finally making some progress! Our angle of heel was steep though, I’m guessing in part due to the added weight of the generator and supplies below. We haven’t added enough to the mast to make a difference – some cable and a couple of antennas – but every little bit of weight aloft does change our heeling. 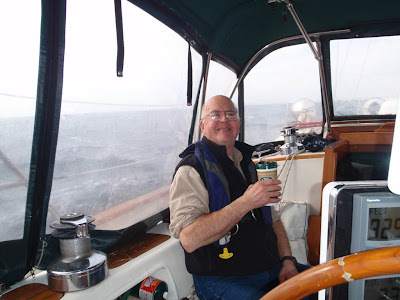 The day was beautiful – warm, fairly gentle waves – some real decent sailing. 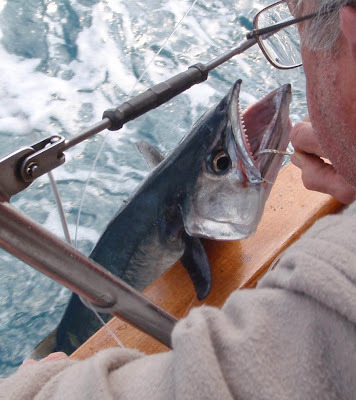 We put out our handline and quickly caught another Little Tunny (Tuna). Kristen was very excited and did an excellent job filleting the fish. 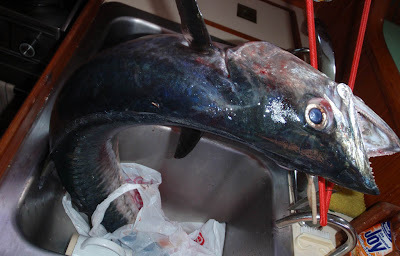 By the way, everyone has told us that some vodka over the gills will quickly kill a fish without creating a huge mess of blood on deck to clean up. We have yet to get this working – I think we’re just getting the fish drunk and into a partying mode. Perhaps we need to use cheaper vodka than the Absolut we have. I know a cheap vodka puts me out quick! Anyway, Kristen cut a piece of the tuna off to try as sashimi, but I wasn’t enthralled with it. As a side note – I mentioned that we had caught some Little Tunny to a salesguy at West Marine. He basically said they were a great baitfish, but not good for eating. I would have to concur. 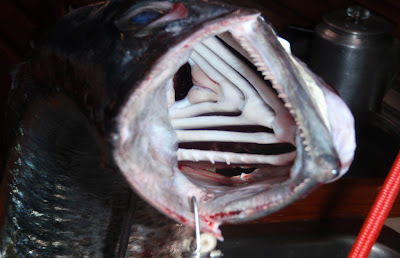 What kind of Mackerel is this? Throughout the day we worked our way offshore again, and by nightfall we were 55-60nm off the coast. Soon after my 8pm watch started, and everyone was below, tucked away, the wind started picking up again and so did the waves. We were once again bouncing through 6ft, VERY short period waves and 20kt+ of wind. We found out later that we had accidentally found the Gulf Stream, but with only our VHF radio for communications at this point (we still haven’t mastered the SSB), we had no idea. I really didn’t enjoy the motion, so I started turning inshore a little, but found myself heading directly into the waves, bouncing like mad again. I made a more radical turn and ran directly for the coast (must have looked like we were ducking in when watching the SPOT!) until we were only 25-30nm out. 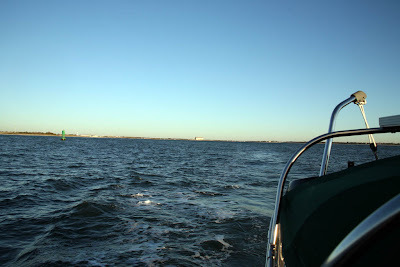 I also slowed the boat down to 4-5kts which kept us from plowing into the waves, and we became much more comfortable. Once again, I stayed in the cockpit, napping, when I handed over the watch at midnight, completely exhausted. Why does the weather have to get heavier at night?? I would much prefer nice calm nights and heavier days where I could see the waves we were steering over. At least it didn’t really get chilly until 2:30am or 3am, but when it did we pulled out the cockpit heater to take the edge off. Day three was wonderful! It was a beautiful day, the sun was out and the air temperature was warming up. We must be in Florida! We put on shorts and short sleeve shirts by the early afternoon and enjoyed being free of the cold temperatures of the north. We once again put out the handline, and throughout the day we caught a mackerel and two small sharks. Kristen managed to slice her hand open on the wire leader when retrieving one of the sharks, and I do believe she’ll make sure she’s wearing gloves in the future! 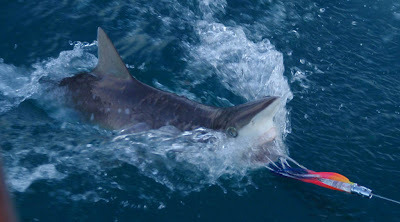 We also didn’t have a gaff or a way to safely remove hooks from fish (we were throwing back the sharks), so Kristen was reaching real close to the Shark’s teeth with a pair of needle nosed pliers in order to pull the hook out. I’ve since bought a hook remover with a 3 foot handle to ensure that my wife actually keeps all of her fingers. She argued that we didn’t need it, but I’m putting my foot down on this one – I like her having ten fingers for many reasons . We noticed that the water color was changing as the day progresses, from a deep blue off of Charleston to more of an aquagreen off the coast of Florida. As the day wound down the wind started to die, so we ended up motorsailing with both main and genny. Poppi was against keeping our speed up. As a matter of fact, he wanted us to turn around and circle the fishing grounds we were in for two or three days! Normally it costs him $200 per day to go fishing and this was free! 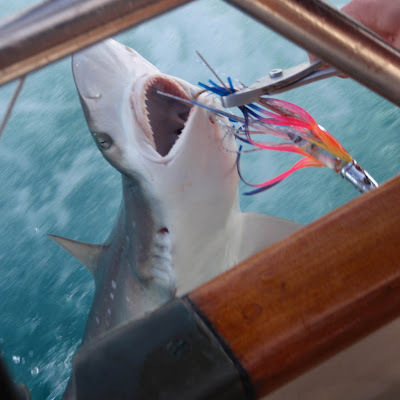 I can’t blame him – catching the fish, even on a handline, is a lot of fun. Reeling it in to see what’s on the end is a great way to pass time during the day. On another note, it was some time during day three that we realized the longer passages are much easier than the shorter ones. Many people had told us this was true, but we couldn’t understand how it could be so. We figured we’d be really exhausted, really quickly, and would have a difficult time after the second day with running the boat. By day three we had settled into a complete rhythm, catching naps and relaxing throughout the day, allowing us to be primed and ready for our watches at night. 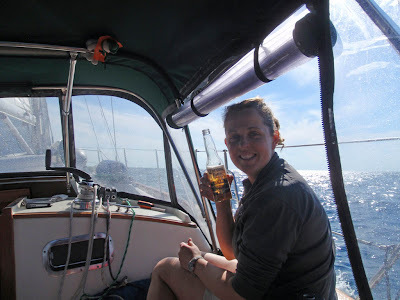 On day two I had told Kristen that I could never see us doing a circumnavigation due to how tired I was. By day three, I was ready to turn off the motor completely and just take as long as we needed to get to Vero Beach. It wasn’t meant to be, however, as we were meeting Kristen’s Mom – Nonni – in Vero Beach on Monday, and it was already Saturday with over one hundred miles to go. We also discovered that we must have had something on our prop for the past couple of days, or it wasn’t completely unfolding. At one point I put the engine in hard reverse, and when I put us back in forward again our speed over ground increased by close to two knots. I’m not sure what was up with that. My night watch was amazing. What an incredible night! First off, though, let me point out that land stinks! We had been so far offshore for a few days that we were only used to smelling the sea. As we came within 10-15nm of land, the stench of burning plastic, ozone and garbage filled our nostrils. This is something we’re used to when we live around it on a daily basis, but re-entering the “smell zone” sucked! On the upside, there was a 10-12kt breeze from the west and almost calm seas. Thirty minutes into my watch I unfurled the genoa, turned off the engine, and cruised at 6-6.5kts at almost no heel. Dolphins were jumping out of the water to my side, there was the sound of water rushing past the hull and bioluminescence illuminating our path. It was almost surreal, and really something quite special. We passed the Kennedy Space Center at around 10:30pm, and the launch towers were lit up like giant torches piercing the skyline. Kristen came on watch at midnight again, and as had become the norm I stayed in the cockpit and dozed off while she kept an eye on our course and looked out for traffic. By 2am, the wind had swung around to the Northeast and we had to swing around by twenty degrees, off course, to keep it on our aft quarter. If we had stayed on course, the wind would have been from directly behind us, and we would have risked an accidental jibe – the sail would have rapidly and forcefully moved from one side of the boat to the other, risking damage to our rig. We furled (put away) our genoa at this point, sheeted in our mainsail to the centerline of the boat, and sadly turned on the iron genny (motor). After having motorsailed for hundreds of miles over the past month and a half, we had thoroughly enjoyed our opportunity to give our motor a rest and listen to only the wind and the waves. We continued through the night and the morning to head towards the Ft. Pierce inlet, our entrance back into the hustle and bustle of the real world and the access point to the ICW which would lead us north to Vero Beach. By 12:45 we had the inlet buoy in sight and we lowered our sails to prepare for the entrance. 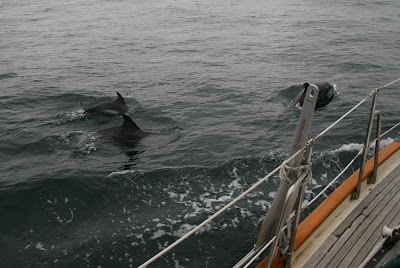 Our timing was terrible – the current was at maximum ebb, or outbound flow, as we headed toward the channel. Because the wind was directly heading toward the current, the possibility existed for large standing waves at the entrance, so I contacted Seatow to make sure we’d be safe. Our engine will only push us at 6.5kts – 7kts if we push it – and the current would be flowing toward us at almost 3kts. This would make our forward speed only 3.5kts, so we didn’t have much margin for error on the approach. Seatow let me know that the inlet was calm, so we were good to go. We turned in around the outer buoy and headed toward the opening. Kristen and Casey kept a lookout for boats in front and behind us, while I did my best to keep our nose pointed directly into the current. If our nose started getting sideways to the current, we would be quickly pushed sideways and possibly lose control. Our entrance through the channel was fairly sedate, but we did find that every Floridian resident must own a boat. There must have been a hundred boats zooming past us in both directions! At one point, a kayaker headed directly across the channel, seemingly oblivious to all of the fast running powerboats zooming around them. We had to slow down to let them cross the bow of the boat ahead of us – not a great thing when it takes a significant amount of time to regain our forward momentum. It all worked out, and we made it the ICW channel. There was only one lift bridge we had to concern ourselves with between us and Vero Beach. We raised them on the radio, and after a little difficulty with clear communications, the bridge was raised as we drew close to it. After passing through, we were quickly reminded as to why we dislike the ICW – long distances between marks, shallow water just outside the channel and power boats with large wakes barging by you in both directions, three abreast, consuming the entire waterway with no way to dodge them. We worked our way up the ICW without incident, passed under two bridges and made an immediate turn after the last bridge to enter Vero Beach. After four days and 445nm, Pelican was a giant salt lick. 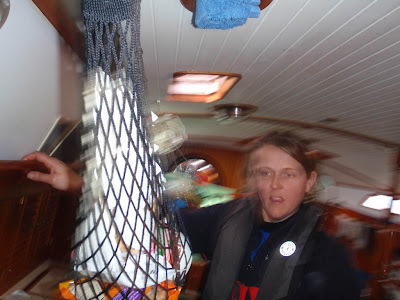 There wasn’t supposed to be any dockspace available for three or four days, so we asked permission to tie up to the fuel dock to wash down our deck and everything that was in the path of the waves and spray of our passage. They ended up letting us stay at the fuel dock for the night, so Kristen, Casey, Poppi and Kaitlin took the opportunity to thoroughly rinse off everything in sight while I did laundry, washing off the salt encrusted sheets from our V-Berth. Sleep came quickly to us that night, and in the morning we headed off to a mooring which was intended to be Pelican’s home for the duration of our stay. With that, I leave you for the moment. I’ll follow up soon with events to date. On Sunday, we leave Poppi on Pelican while the rest of us head to Disney for a few days of fun. I don’t know if I’m looking forward more to the park, or to the king sized bed with a pillow top and down comforter!